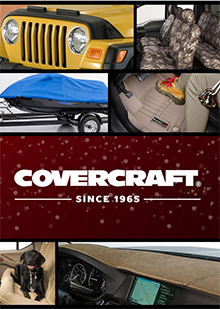 Covercraft catalog offers premium quality interior and exterior protection for your auto, RV, motorcycle, and ATV, with custom covers, mats, front end bras and sunscreens. Enter code - CATALOG - at checkout to receive free shipping on all orders in the Continental US. Car Covers and Exterior Protection - Protect your car inside and out using your Covercraft coupon code for the best investment in custom vehicle covers, front end masks, carbands and tire covers. You will find hundreds of options for your custom car or truck cover, with premium quality indoor and outdoor fabrics, and options for UV, rain, snow, dust, ding and bird protection. Or you can select a cover cover from top brands like Carhartt, Wolf Ready Fit, Covercrafter, or WeatherShield. They have the vehicle protection you are looking for, with options for custom truck cab area covers, custom cab coolers, hardtop covers for convertibles, and interior covers for convertibles. Vehicle Interior Protection - Make your vehicle seats tough with Carhartt seat covers, seatsavers, seat gloves and canine seat protectors. Your car or truck will stand up to everything you unleash on it when you trust vehicle protection products using the Covercraft coupon code. They have dash covers, UV resistant sunscreens for your windshield, and Berber and plush carpet floor mats. Dog owners will appreciate the good looking covers, cargo liners and pet hammocks from Pet Pad Seat Protector and Canine Covers. Powersport Covers - Invest in the best protection for your ATV, motorcycle, scooter or personal watercraft, with indoor and outdoor covers and cover clamp kits. PackLite, Seat Shield, Harbor Shell and Form-Fit are the top rated brands to protect your investment in your power sport vehicles, from your Harley Davidson motorcycle to your fleet of PWCs. Their custom covers come with the details you would expect, like gas flaps, reinforcement construction, tie downs and wet bags. Auto Storage and Accessories - Keep your car, truck, ATV or motorcycle organized with cargo bars, pro nets, Spidy Gear Webbs and a handy collection of soft sided vehicle luggage, zippered tote bags and pocket pods. If toting gear challenges your vehicle space, the Covercraft catalog has custom trunk storage and universal back-of-seat latch-closing pockets. Manage your vehicle odds and ends with gear that is sturdy and good looking. Covercraft is favored by automotive enthusiasts for quality, durability and smart design. No matter what you drive � from street rods, imported sports cars to work trucks, ATVs and Harleys � they�ve got you covered.